Klikněte na fotografii a zobrazte všechny dostupné fotografie k Amazing 2bed 2bath converted warehouse onThames. 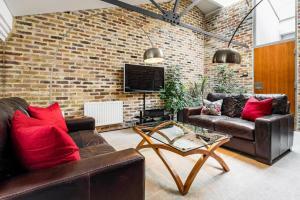 Located 5 km from Tower Bridge and 6 km from Greenwich, Amazing 2bed 2bath converted warehouse onThames is set in Southwark of London. Complimentary WiFi is featured. The apartment is equipped with a TV, 2 bedrooms and a living room. The kitchen has an oven and a microwave. Tower of London is 6 km from the apartment, while O2 Arena is 8 km from the property. The nearest airport is London City Airport, 12 km from Amazing 2bed 2bath converted warehouse onThames. Kindly note the guest is liable for any damages nade to the property by themselves during their stay, and will be charged for damages if necessary. Guests are required to show a photo identification ID and credit card upon check in. If the lead guest will not be present at check in, guests will need to contact the property within 48 hours after booking to request approval for a third party reservation. The card used to make the reservation must list the same name to make the reservation. If these details differ, then additional verification information must be sent within 48 hours after booking. Guests are required to show a photo identification and credit card upon check-in. Please note that all Special Requests are subject to availability and additional charges may apply. Please inform Amazing 2bed 2bath converted warehouse onThames in advance of your expected arrival time. You can use the Special Requests box when booking, or contact the property directly with the contact details provided in your confirmation.